Father Ronald Rolheiser, O.M.I., is an Oblate priest, theologian and popular spirituality writer. He is president of the Oblate School of Theology in San Antonio, Texas. 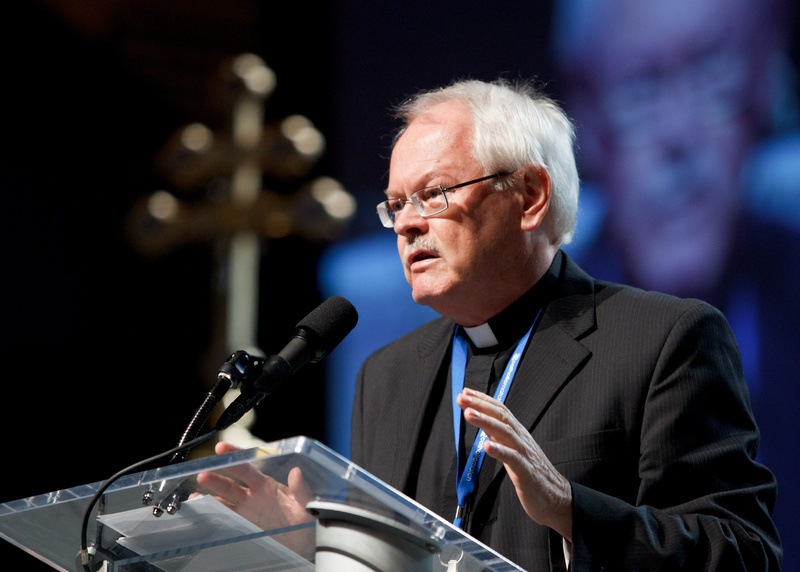 He received his doctorate in systematic theology at the University of Louvain and is a member of the Catholic Theological Society of America, the Canadian Theological Society, and the Religious Studies Association of Alberta. Father Rolheiser previously taught at Newman Theological College in Edmonton, Alberta, and he writes a column in the Catholic Herald that is featured in approximately 60 newspapers in five countries. Father Rolheiser’s latest book, Sacred Fire: A Vision for a Deeper Human and Christian Maturity, was published by Image Doubleday in March 2014. On Aug. 13, I interviewed Father Rolheiser by email about his writing and work. Your follow-up book to The Holy Longing is called “Sacred Fire.” What does that title mean to you? Picking a title for a book is something I normally leave to the publisher, who has a better expertise on this kind of thing. When I write a book, I always have a very clear intent in mind and the intent of this book was to try to articulate some challenges for a deeper human and Christian maturity. That makes for a subtitle, but you always search for a more poetic title that can serve as hermeneutical key for the book. Sacred Fire was suggested to me by Robert Ellsberg, the Publisher at Orbis Books who’s a friend of mine. The intent was to link it in some way to The Holy Longing, since this is really like Volume Two of Holy Longing. We initially toyed with the idea of calling it Holy Fire, but, that would, I believe, have led to some unfortunate word associations – “holy fire, holy smoke!” Sacred Fire serves the book well as a poetic title. As I explain in the Preface, fifteen years ago, Eric Major, then the Religious Editor at Hodder & Stoughton, asked me to write a book on spirituality. Having taught courses in spirituality for a number of years, I seized on the idea with enthusiasm, immediately imagining how a wide survey of contemporary spirituality might translate into a book. But Eric Major had a different idea. “What I want is for you to write a book that I can give to my grown children which explains to them why I still believe in God and why I still go to church – and that I can read myself on days when I am not so sure why I still believe and why I still go to church.” The Holy Longing resulted from that conversation. And Eric Major’s instinct proved correct; there was a crying niche for just that kind of book. The book found a huge audience, inside of all Christian denominations. But while The Holy Longing is a solid book, one that offers a certain basic foundation in Christian spirituality, it remains precisely that, a foundational book, a basic course, but not a graduate or final course. The Holy Longing is a book that is intended to help us “get our lives together.” But where does one go from there? What lies beyond the essentials? Where do I go once the basic question in life is how can I give my life away more generatively, more purely, and more meaningfully? The intent of Sacred Fire is to try to address this question: How can we live more mature and more generative lives? What constitutes deeper maturity and how do we reach that place? And, not least, what constitutes a truly generative following of Jesus? That is the intent of Sacred Fire. In essence, it tries to do what its subtitle promises, offer a vision for a deeper human and Christian maturity. There are two aspects to that question: First, in terms of religion and denominational affiliation, Sacred Fire is intended more directly for Christians of all denominations. I am a Roman Catholic priest and I write, without apology, from that perspective, so probably unconsciously I am writing for a Roman Catholic audience; but this book, like my others, is also intended for Protestants and Evangelicals with whom my past books have enjoyed a wide popularity. More widely even it is intended for anyone who is sincerely searching for a deeper maturity, human or spiritual. Second, its intended audience is, to use the classical categories of John of the Cross, more those who are proficient in their human and Christian journey rather than those who are beginners in that journey. Indeed the early chapters of the book try to articulate that distinction, that is, by suggesting that there are three essential phases to human maturity and Christian discipleship: First, the struggle to get our lives together, the struggle for basic maturity; next, the struggle to give our lives away, the struggle for a deeper, more generative maturity; and finally, the struggle to give our deaths away, the struggle for radical maturity. Sacred Fire, which is intended to be the middle book in a trilogy, wants to address those who are in that second stage, namely, those of who are struggling to live more mature and generative lives. Hopefully, eventually, there will be a third book, which will address the struggle to give our deaths away. The final chapter of Sacred Fire already attempts to lay out the foundations for that future book. What does the subtitle “A Vision for a Deeper Human and Christian Maturity” mean? The whole intent of Sacred Fire is to try to lay out a vision drawn primarily from the vision that Jesus gave us, but supplemented by vision of one of the greatest structural mystics in our Christian history, John of the Cross. Partly, what I am trying to do in this book is to take the categories of John of the Cross and reformat them in a language that is more accessible for today’s Christian. As well, I try to integrate some important insights from anthropology apposite to the human stages of growth, insights, which, I believe, can help us to more deeply understand the challenge of Jesus. For instance, Sacred Fire tries to show how some of the categories of anthropology interface wonderfully with the categories of John of the Cross and, of course, with the challenges of Jesus. In particular, in this regard, I would like to highlight the chapter on Blessing, drawn as much from anthropology as from scripture, and which, I believe, challenges us to a thoroughly radical depth of human maturity. In brief, two things: One, a more synthetic vision of the spiritual life. Today we live in an over-rich plurality where we have so many rich insights into so many things. But, we are weak, very weak, on synthesis. We no longer see the whole, only interesting pieces and we don’t know how to set those pieces together. I hope the reader of Sacred Fire will walk away with more of a synthetic vision of Christian spirituality, a singular chain upon which to hang individual pieces. Second, I hope the reader is able to take away some very specific challenges from Jesus vis-à-vis growing to a deeper maturity and being more generative within life. I try to offer a number of very specific Gospel challenges towards this end. You’re an Oblate of Mary Immaculate and a systematic theologian. How would you describe your spirituality to someone who didn’t know anything about your background? I belong to a Missionary Congregation, the Oblates of Mary Immaculate, and I am very proud to wear that label. We have a proud history and a vibrant present. We were founded to serve the poor and to live and work on the margins where the poor are. For the most part, we have done that and continue to do that. For example, I come from Western Canada. The Oblates founded every diocese but two in the entire Canadian West. Today there is a vibrant diocesan church in all those dioceses, even though few Oblates remain. For our part, we’ve moved on, to new frontiers, to other edges, but we have left a vibrant church in our wake. And we still are where the poor are. Today, if you go into cities like London, Leeds, Edinburgh, and Dublin and go to those sections of the city where the police are afraid to go, you’ll find the Oblates there. That’s also true for the borders of Texas and California, just as it is true for those areas in the Philippines where Islam poses the most threat. You’ll find the Oblates there, living with the people, in dialogue with the Islamic militants, helping them sort through their own issues of poverty. During the six years that I served on our General Council in Rome, we founded two new missions even though we were radically strapped for the resources to do so, but we began those missions because they were in the two poorest countries in Africa. I minister and write out of that missionary context. In terms of our spirituality, our Founder, St. Eugene de Mazenod, was a pragmatist and an eclectic. He drew his spirituality from a variety of rich sources: Among others, he drew from the Sulpicians, who had formed him in the seminary; from St. Alphonse Liguori, the Founder of the Redemptorists; from St. Ignatius of Loyola, vis-à-vis the structure of religious life and apostolic community; and from the Carmelite tradition on prayer, contemplation, and asceticism. He was humble, wanting to rely on the giants who were already out there rather than on building only with his own ideas. And that has been, in a way, our Oblate modality ever since. We are missionaries on the ground, content to lean on the giants. It’s been my way too. I am an unapologetic eclectic. My spirituality, both for my own life and for my teaching and writing, has been most deeply shaped by: St. Augustine, Thomas Aquinas, John of the Cross, Karl Rahner, Henri Nouwen, Robert L. Moore, and a lot of good novelists. So that list includes an Augustinian, a Dominican, a Carmelite, a Jesuit, a diocesan priest, and a Methodist layman. You’ve written a lot on prayer. How do you pray? I try every day to do two kinds of prayer: First, as baptized Christian and an ordained priest, I pray every day liturgically, namely, I pray the Church’s prayer, through Christ for the world. This, quite simply, means celebrating the Eucharist and praying the Prayer of the Church, namely, Morning prayer and Vespers. As I pray these, I always try to be clear in my intent: This is priestly prayer for the world, not my private prayer. Second, I try each day to pray privately. This has taken a variety of forms through the years: from the family rosary and my rote morning and evening prayers as a child, to the periods of meditation and mental prayer prescribed for us in the seminary, to the many years when I did various forms of Lectio Divina, often leaning on good spiritual books to guide my meditations and colloquies. More recently, I am doing mostly contemplative prayer, that is, Centering Prayer, believing that, at this stage of my life, what I really need to do is sit quiet before God, resisting the urge to talk about my woes and aches. My mantra now in prayer is simply: Be still, and know that I am God. I live a pretty pressured life and, during my days, time moves very quickly. In Centering Prayer, time moves at a snail’s pace, constantly testing my patience. That’s one of the reasons I believe that it is good for me just now. Also, I like to take a good walk almost every day and that, I find, is a good time to pray the rosary, which is my form of centering prayer when I am walking. As well, I begin each day, before I do Morning Prayer, by reading the readings for the Eucharist for that day, particularly the Gospel, and I try to make that color my day. How are things going at the Oblate School of Theology right now? Like all theology schools, Roman Catholic and other, we have constant concerns about enrollment, even as ours is at least holding steady. We have just finished a major building project, constructing a new complex that houses an auditorium, state-of-the-art classrooms, and a new student center. This has radically modernized our campus. More importantly, though, we have finally, after nearly ten years of work, established fully an Institute for the Study of Contemporary Spirituality which offers programs at three levels: Continuing Education, a Masters’ level, and a Doctoral level (a Ph.D or a D.Min). To bolster our faculty for this, we have recruited some renowned faculty in the area of spirituality; Philip Scheldrake now teaches here full-time; as well, we have drawn in, as affiliated faculty, Berni McGinn, Wendy Wright, Peter Tyler, and Michael Higgins, among others. Most importantly, in fidelity to our Oblate charism, we are striving to continue to reach out to the poor. Thus, within the last five years, we have initiated programs to reach out to the rural poor in the San Antonio area, to take our certificate programs into the Texas prison system, and help Afro-American churches. Like all theological institutions, we are never flush with either students or money, and we live in trust of God’s providence. You’ve been a voice for moderation in the Catholic Church. Are there any signs that American Catholicism is finally moving beyond the polarization of recent decades? Yes, I feel that the worst of the polarization is behind us. Pope Francis is helping lead the way, but it is more than just him, it’s the times. Bitter polarization, like a nasty virus, eventually runs its course. I see a lot of truth in the old Hegelian concept of ideas moving through these three phases: thesis, antithesis, synthesis. I think that, in terms of the tension (to risk some simplistic categories) between the Vatican II generation and the John Paul II generation, we are moving towards a synthesis, much of the bitterness has run its course. Besides we are now looking at a new generation that is neither Vatican II nor John Paul II. I suspect they will have little patience with our old ecclesial wars. From your perspective, what do we need most in the Catholic Church today? 1. We need to move beyond the polarization of the past years, with both sides valuing more what they are for rather than what they are against. 2. We need, all of us, to have a deeper, personal, inner grounding in faith – verifying the truth of Rahner’s famous comment that this generation will either have to be mystics or non-believers. 3. We need to re-inflame our romantic imaginations in terms of faith and church. We have lots of biblical scholarship, lots of good theology, and lots of good spirituality. We can handle the intellectual imagination, but we no longer know how to make people (not least our own children) fall in love with the faith and the church, the way some of the stories and lives of the saints did for me when I was a child. 4. Finally, not least, we need, all of us, to bear down on some essentials that we have tended to bracket and ignore these past years, namely, graciousness, charity, and respect…towards everyone! In a word, wonderful! I think he is wonderful, given to us by the Holy Spirit. I sense that he is listening to both God and to the world and is directing us to exactly where we should be going. He is deep and he is deeply pastoral, and the whole world, not just Roman Catholics, is intuiting that. And he is leading with grace, that is, precisely with graciousness, charity, and respect towards all. What do you hope people will take away from your ministry and writings? In brief: I hope that my ministry and writings will help others see that faith and the church are credible and that they are inextricably connected to everything that is moving most deeply inside of us, our desires, our aching, our ambitions, our sexuality, even our most pagan and irreverent feelings, our “holy longing.” With Augustine, I believe that God has made us for Himself and our hearts are restless until they rest there. And, with Karl Rahner, I believe that the human soul is a thirsty cavity created to be filled by divine infinity and is aching unceasingly for precisely that. My hope is that my ministry and writing will help people personalize those deep truths so that, following the hungers and aching of their own hearts, they will find their way into faith, into our churches, and, most important, into a personal intimacy with Jesus. Rolheiser is a favorite - thanks. But, as I count it, you have now interviewed 31 men and 5 women. Of the few women, you managed to find several whose views are not representative of the views of most Catholic women (Mary Gordon being the exception perhaps) - even to the point of seeking out an atheist who supports the bishops' battle to deny the religious freedom of non-Catholics working in the private sector and the non-profit sector the right to the same medical coverage as women who do not work in those sectors. My, my, along with your (celibate male) defense of Theology of the Body, one might suspect a bit of bias is operating in your choices. Please look over your choices and do a little reflection. According to your bio, you chose to go to one of the only all-male colleges left in the US as an undergrad - maybe ask yourself why you chose to study in an environment where you would not have to live and work with women in an environment where they are viewed as equal to men? Is there an undiscerned bias reflected in your choice of interviewees? Is it reflected in your choice of the few women you did interview? There are so many brilliant and accomplished women out there whom you could have interviewed - but they might not share your personal understandings (most female theologians are more "liberal" than you are when it comes to church teachings) - is that why you have not sought any of them out? This series had so much potential, but it has fallen short, largely because you have chosen to focus on male understandings, as do most clerics in the Catholic church. This is why opening holy orders to women is so needed if the church is ever to become what it should be - God made them male and female in God's image, but the distortions caused by the insistence on imposing the understandings of male celibates exclusively on church teaching, - clinging to one-half--of-the-brain - thinking - will never be corrected until the church reflects both the male and the female in its governance and in its teachings. I love this interview, and I would also enjoy seeing additional interviews with women of the faith. Rebecca Chopp is the new Chancellor at the University of Denver. PhD University of Chicago, she's taught theology. She is said by some to be the best college head today, and has written extensively on the impact of women in seminaries, it would be very interesting to see is she sees the male / female issues in the same way as these two commenters complaining America doesn't have enough interviews with women. I read, with interest, the comment that you've interviewed more men than women. It's an accurate observation. I also notice that some of the people you interview represent a conservative/reactionary point of view. My personal observation -- and I am not infallible -- is that in choosing you as one of its regular contributors, the America editors are taking a turn to the right. America has always been at the forefront of Catholic periodicals always open to new ideas and refreshing perspectives. From what I've read of your work so far, you seem to embody the conservative point of view of many of our younger clergy.